Here is the case of the week with history. The questions will be posted on Friday and the answer will be updated on subsequent Tuesday. See the archives of case of the week in the TOPICS. A 72-year-old man is admitted for increased shortness of breath, a cough productive of yellow sputum with scant hemoptysis, left pleuritic chest pain, and low-grade fevers. His past medical history is notable for hypertension and diabetes. 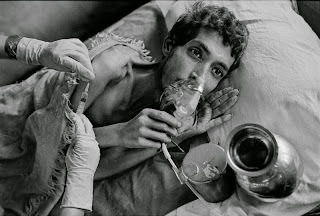 He has a history of 80 pack-years of tobacco use, and was a ship-yard worker while in the military. On physical examination, his temperature is 38°C and his lung examination reveals decreased breath sounds on the left. 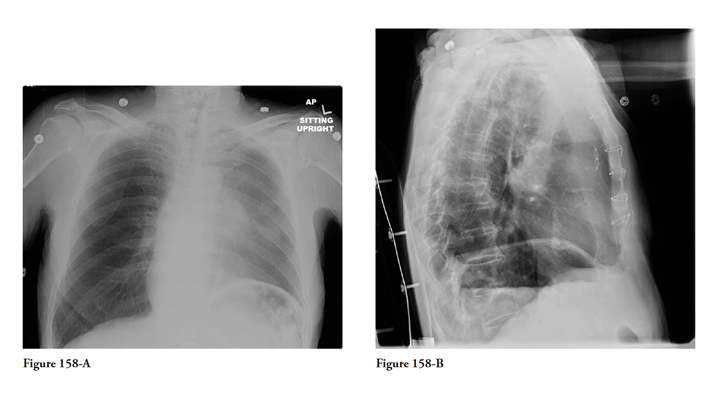 His frontal and lateral chest radiographs are shown in Figure 158-A and Figure 158-B. What do you expect to observe on the chest CT scan? B. Left upper lobe (LUL) consolidation. Give your answer in the comment box. Please come back on Tuesday for the answer.